1 Rinse fish fillets, pat dry and cut into 3 cm (approximately pieces. Squeeze juice from limes and drizzle over the fish pieces in a bowl. Let marinate in the refrigerator. 2 Peel the garlic and chop finely. Rinse chile pepper, wipe dry and cut into slices. Peel and finely grate the ginger root. 3 Rinse tomatoes, wipe dry, cut into quarters and remove seeds. Coarsely chop tomatoes. Peel mango, cut into slices around the pit and coarsely chop. Peel the onions and cut into thin slices. 4 Heat the oil in a pot and cook mustard seeds until they pop. Add onions, garlic, ginger and chiles and cook, stirring, for 1 minute. 5 Add cilantro, cumin, curry powder and turmeric to the pot. Sauté briefly and then pour in the coconut milk. 6 Add tomatoes to pot, bring to a boil and let simmer over medium heat for 4 minutes. 7 Add mango and cook for 1 minute. 8 Season fish lightly with salt and add to pot. Cover and cook until fish is opaque throughout, 4-6 minutes. Rinse mint and shake dry. 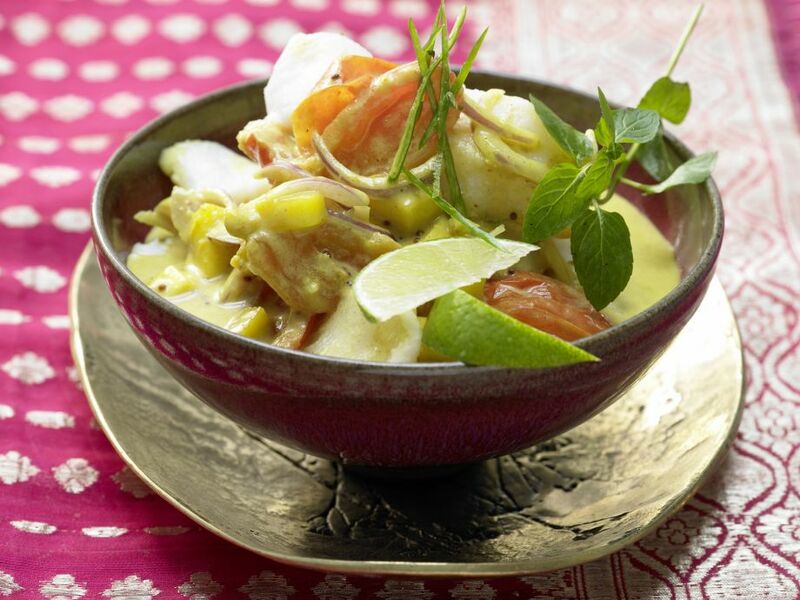 Garnish fish curry with mint and serve.